My very talented friend and I hosted a 4th of July Tailgate/BBQ on Thursday. We half joked it was more like a "Pinterest" party because we ended up implementing a few of the pins that we had saved on our Pinterest boards. 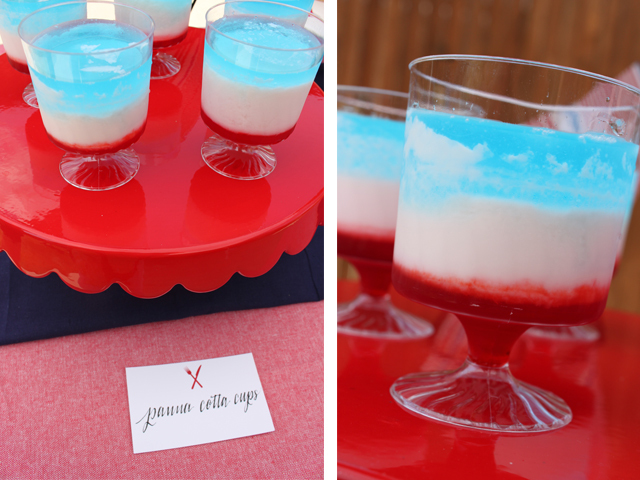 One of my favorite items from the BBQ and one that I will make again for our tailgates, was the Panna Cotta cups. I adapted the recipe from Sprinkle Bakes and from The Kitchn. Directions: Pour equal amounts of grenadine syrup into the cups. I poured just enough to cover the bottom portion of the cups. (I used these miniature dessert cups from Party City.) Let freeze overnight. To make the panna cotta, sprinkle the gelatin over the milk in a small saucepan. Let sit for about 1 to 2 minutes or until it "blooms", the gelatin grains will swell and wrinkle and look like they've absorbed some liquid. Stir in the sugar and warm over low heat — don't boil! — for about 60 seconds, or until both the sugar and gelatin dissolve. (Rub between your fingers and see if there is any grittiness left.) Whisk in the cream and any flavorings, like vanilla. Once the panna cotta has cooled. Very gently pour into cups over a spoon so as not to disturb the grenadine. (Some of the red from the grenadine may mix with the white of the panna cotta. Don't worry, it will usually float back down to the bottom. Refrigerate at least 1-2 hours. Pour the blue floater on the top (vodka or curaçao) when ready to serve. It's best to serve with a small spoon.